Designed to foster within our clientele a greater sense of confidence in human anatomy and dissection procedures, the International Clinical Dissection Program allows participants to develop a thorough knowledge of anatomy with clinically-oriented exposure. The program not only provides more technical, hands-on dissection experiences not easily accessible, but also offers fantastic networking opportunities and inter-professional exposure. Instruction: The dissection sections will be overseen by our team of professors, senior medical students/residents and retired surgeons to enhance the personal support of the participants. Seminars will be given by specialists in the seminar topic. 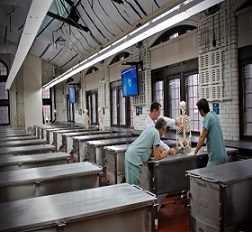 Schedule: Monday to Friday: 9:00 a.m. – 4:00 p.m.
2 participants per cadaver (standard embalming). Participants will perform on average 5 hours of dissection/day. 1-hour clinical seminar will be offered daily. 1-hour welcome/orientation session (with tour) will be organized at the start of each module and will include a section on laboratory safety, ethical use of cadaveric material and proper protocol for usage of dissection equipment. Modules can be purchased separately or as a package. Pricing includes tuition and materials. Participants will be supplied with lab materials (e.g. lab coat, gloves, dissection instruments.). Location/Facilities: The program will be run from the Strathcona Anatomy & Dentistry Building on McGill’s Downtown campus. The campus is located in the heart of downtown Montreal, close to excellent shopping, restaurants, summer festivals and events, and a safe public transit system. Selection Criteria: Due to the limited number of seats, the program reserves the right to select candidates based on the best combination of educational background and experience. Program Note: The International Clinical Dissection Summer Program is a non-credit program. Successful candidates will receive a certificate of participation from the Faculty of Medicine, but no transcripts will be issued. Completion of any or all modules will not count towards your degree of study. Immigration: For international applicants, please note that the status required for participation in this non-degree program is that of tourist. Please consult your country's specific entry requirements to enter Canada as a tourist, in order to ensure that you will be able to meet the entry requirements. McGill University and the Department of Anatomy and Cell Biology do not take responsibility for foreign applicants' entry into Canada. Fee penalties will not be waived due to delays in visa processing, where applicable.